It is the last day of the challenge and I am so happy that I did! It has been difficult on some days to take the time to paint, especially with the weather being so nice. I also did some traveling during the month but discovered that if I planned my time well and got up early, I was able to get a small painting completed. For my final post of the month, I thought I would show what I have been working on when I wasn't painting my supplies. It is a portrait of my daughter's friend. Painting everyday has made me fall in love with painting again. As mentioned before, due to circumstances, I got away from it and forgot how doing something creative on a daily basis improves my mood, keeps me focused, and inspires me to be a happier and healthier person. 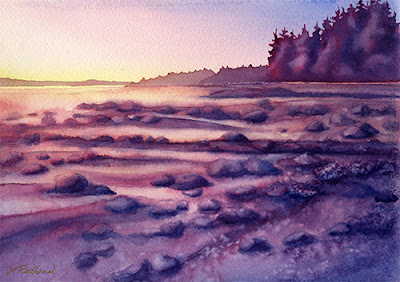 I must admit that it will be difficult to continue to paint daily, especially since I will be spending the rest of the summer with family, but I can bring my studio and camera with me as I try to stay inspired. Another must have for an artist is a pencil. 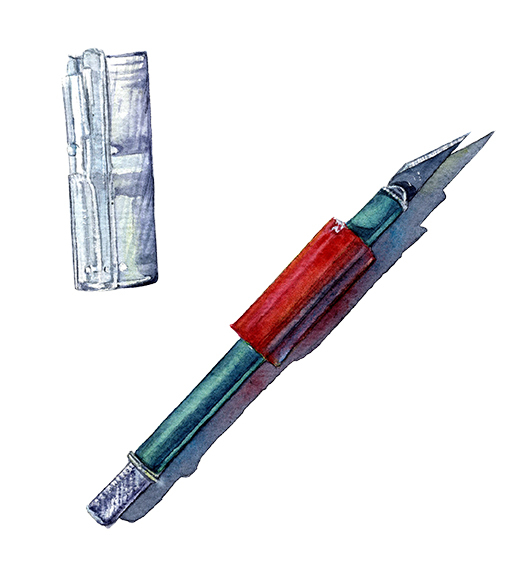 I prefer using a mechanical pencil because I like to have a sharp point at all times. 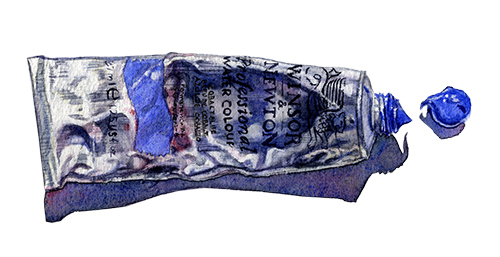 I keep a palette knife in my studio for a variety of reasons so here it is! An essential tool for the impatient and for wet, rainy days when nothing ever seems to dry. 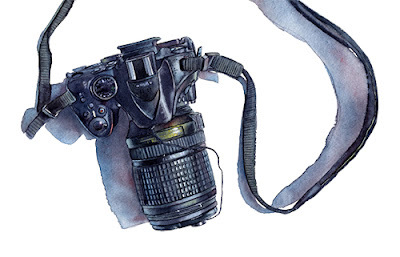 I needed a break from painting paint I decided to paint my camera since it is a very important tool in my studio. This painting actually took me 2 days to complete and so didn't work on it just for today. New Gamboge is a wonderfully warm yellow. 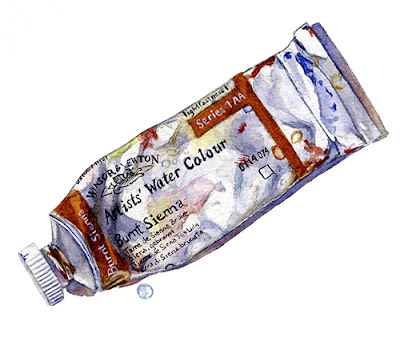 Great for skin tones. A nice cool yellow. Great for landscapes. Another red that I love. A beautiful warm red that is almost orange. Today I chose to paint quinacridone rose for a couple of reasons. One is that it is an awesome color. The other is because it is the same as permanent rose. I usually include permanent rose on my supply lists for my classes. However, if you have quin rose, that works just as well. An all time favorite - permanent rose. I really did not like pink when I was little. I would get angry at my mother for buying me pink items. But now I love it! Of course it has to be a bright pink, not some pastel pansy pink. A pink that screams, look at me! I'm perfectly pink! 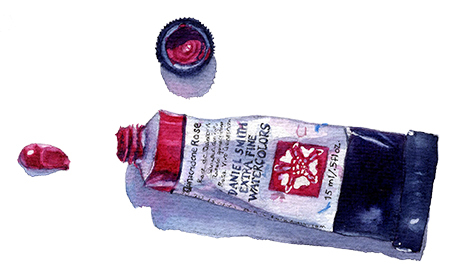 Next are the reds in my palette, starting with an extremely versatile and must have color - Permanent Alizarin Crimson. I am not a big fan of using it alone but love to mix with this color, especially when making darks. 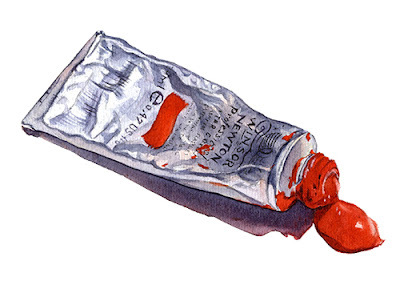 And it must be the permanent kind, not the regular alizarin crimson. I am quite pleased that I have painted everyday this month so far. 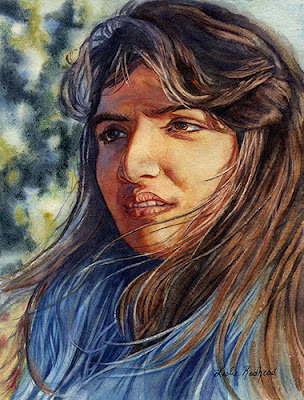 I use to paint nearly everyday but fell out of the routine the past couple of years for personal reasons. Getting back into the routine has sparked my imagination and ideas are starting to flow. Another sienna color. This time raw sienna. I usually don't mind if my colors are either Winsor & Newton or Daniel Smith but for the sienna, they must be Winsor & Newton. I find that they are more transparent and brighter in color. 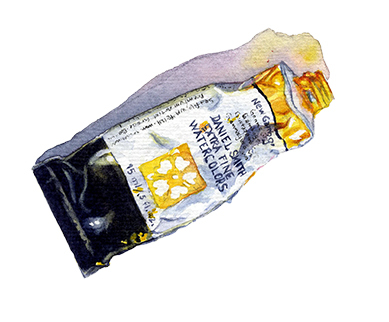 Now on to my favorite earth colors, starting with burnt sienna. I have to buy the big tube of this because I go through it so quickly. Blue is such a wonderful color and I tend to gravitate toward all things blue. Maybe that is why I started with painting the blues in my palette. 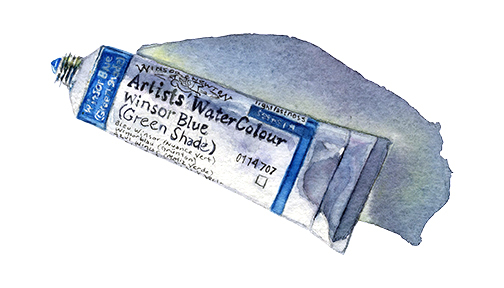 Winsor Blue is one of my favorite to mix other colors with. It feels so clean and fresh to me. It seems to keep the colors that it mixes with beautifully transparent. 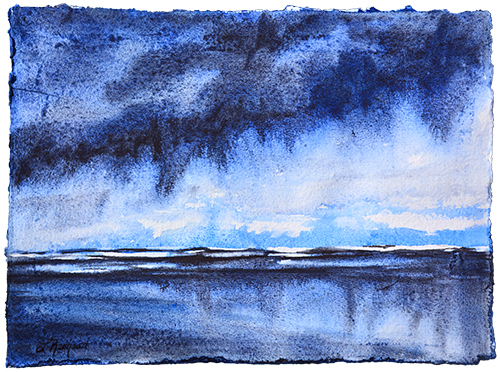 Today I painted another beautiful blue. 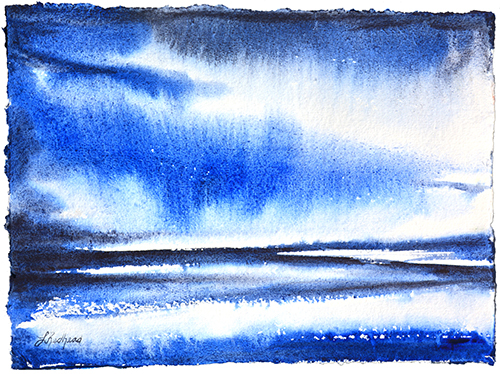 I not only love the hue, but I also love the way that French Ultramarine granulates and mixes with other colors. I am now into painting my favorite tubes of paint, starting with my favorite sky color, cobalt blue. 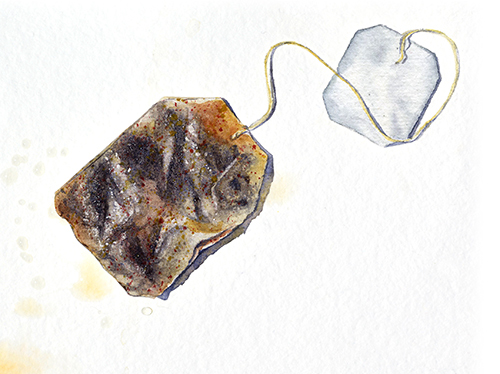 I sat down to paint this morning with a cup of tea and decided to paint the teabag. Since tea is part of my studio routine I thought it fit in well with my other studio tools. 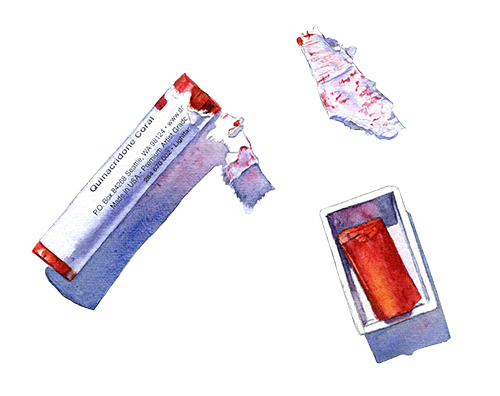 I recently purchased some watercolor pigment sticks from Daniel Smith. 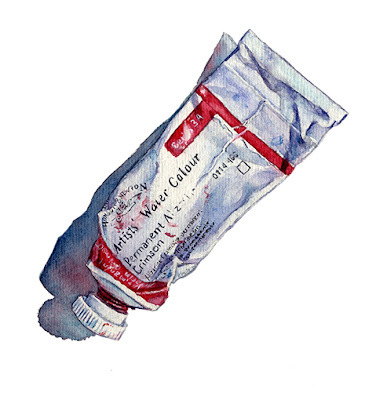 These are concentrated watercolors that can be wet on the stick or after drawing something on paper. 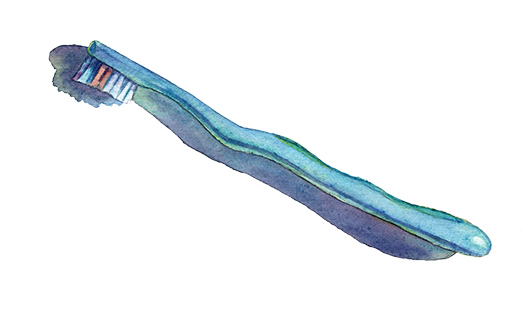 Part of the stick can also be put in a pan and with the addition of water, becomes just like paint from the tube. 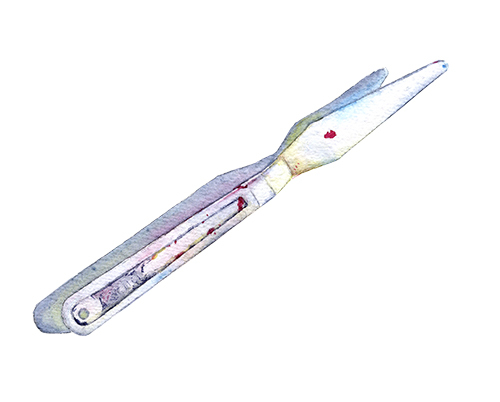 I continue to paint some of my favorite tools. This one is my smallest palette. Another perfect painting gadget for travel. You are probably wondering how a the above water container has become one of my favorite tools. 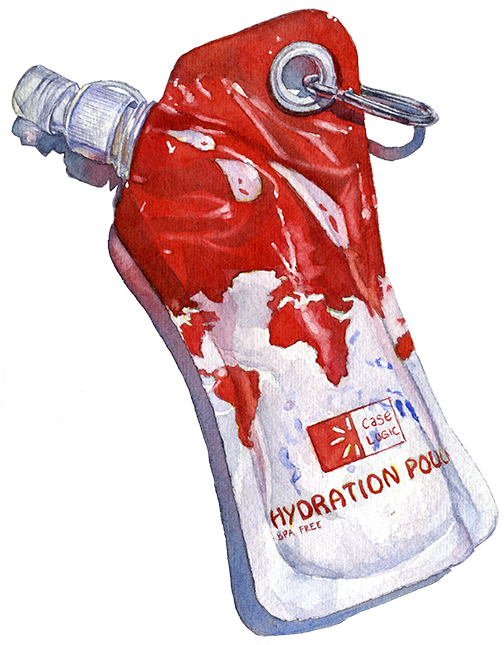 I actually use it to carry my water when I am doing some outdoor painting. 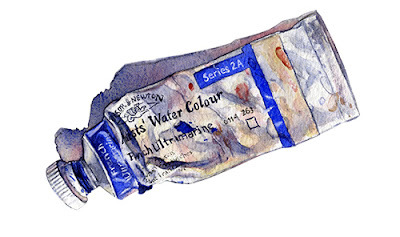 Day 9 of the World Watercolor Month Challenge. I continue to paint some of my favorite painting tools. 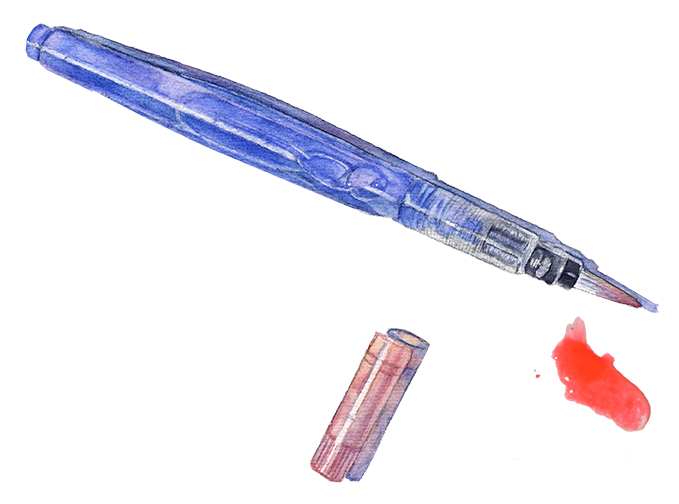 This one is a water brush. It holds water so I don't have to carry any in a larger container. I find it perfect for travelling. Especially for the airplane as I don't want that container of water to spill on me or my neighbor. Painting seems to calm my nerves and passes the time on those long flights to Europe. Found this beauty in a shop in Ronda, Spain. Love doing big washes with it. 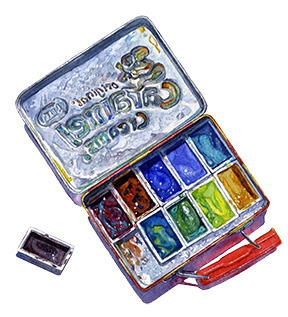 For Day 7 of the WWM (World Watercolor Month) Challenge by doodlewash.com, I decided to start to paint some of my favorite things. 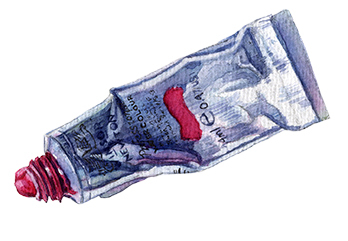 Today it is one of my favorite brushes. 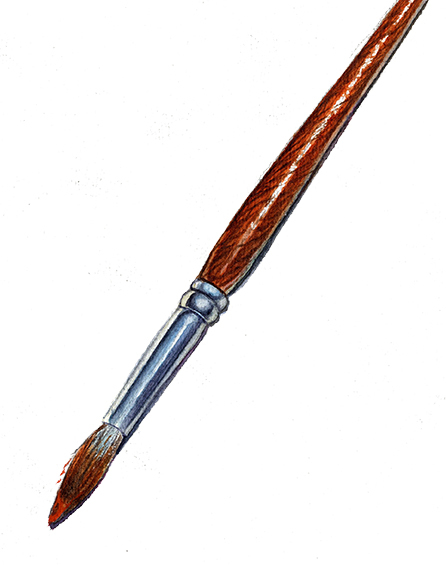 A size 12 sable brush. 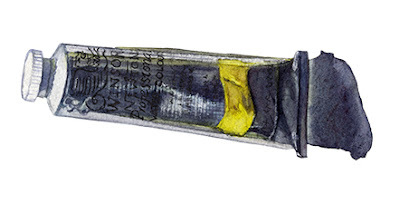 This brush has seen many painting adventures with me and I hope that it continues to see many more. Day 6 of World Watercolor Month Challenge. I thought I would try to recreate yesterday's painting but with a different color scheme. 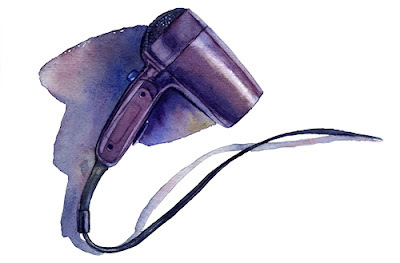 Day 5 of the World Watercolor Month Challenge. I've been working with color studies and color chords. This painting is from a photo of the Stanley Park Seawall in Vancouver. Today is Independence Day in my home country. 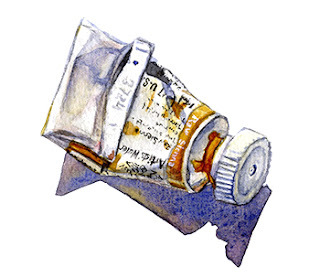 I thought I would paint an American Icon and one of my favorite places to celebrate for Day 4 of the World Watercolor Month Challenge. 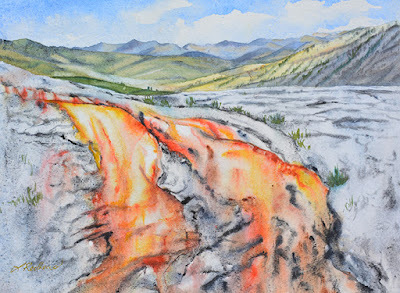 It is Mammoth Hot Springs in Yellowstone National Park. I love how alien the springs look next to the mountains of Montana. Day 2 of the World Watercolor Month Challenge. I am posting a day late because I tend to paint in the afternoon/evening and am not able to photograph the painting properly. Storm Study inspired by my painting Stormchaser but different colors and smaller. There is a challenge on social media for the month of July to paint in watercolor everyday for the month (#worldwatercolormonth). I have gotten out of the habit of painting on a daily basis and recently decided that I need to make it my goal to get back to it. When I saw this challenge, I thought it would be a great start to get back to painting daily. 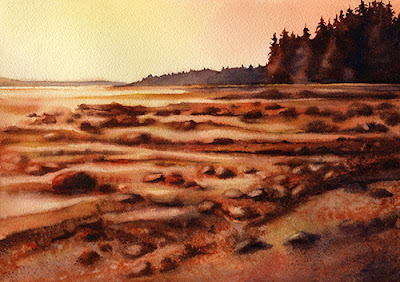 So I am accepting the challenge and Seascape I is my first painting. 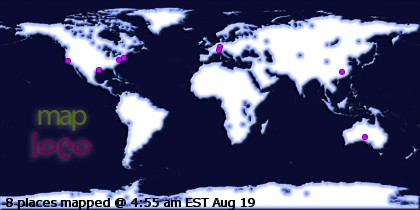 I did this yesterday (July 1) but by the time I got around to photographing, the light was fading.